20 July 2013: It is some months since I produced an Energy Levels diagram, and since the tee-piece leak and the repair to the leak, it is time to do another. Just before the leak occurred, there was good sunshine and the levels were on the way up nicely. There was a period of time when I was waiting for the replacement tee, the scaffolding was up for a whole month. (The more recent leak of July was fixed so quickly, it doesn't cause a blip on the curve, because it was just equivalent to a couple of cloudy days. I'm not sure why the curve should drop so steeply at that point in May. Although May was cold, it wasn't cold enough to have the heating on, although hot water was still needed. It could suggest that the borehole had warmed up, but without the additional heat being added, the energy level was dispersing outwards because the temperature had risen to higher than would be normal for May without charging. The Ground Temperature line looks slightly different. The recent winter was not particularly cold, but it was very long and dreary, so the winter curve is very wide, and the dodgy spring (combined with the leak in April May and the heat wave of July meant that there was a strange look to the curve climbing out of the winter into summer 2013. 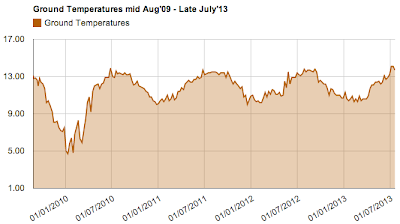 The fact that the ground temperature of 21.7.13 has dropped back to 13.7ºC reflects the energy curve (top), implying that the larger volume still needs more energy to be injected before equalling the energy levels of, say 2011.